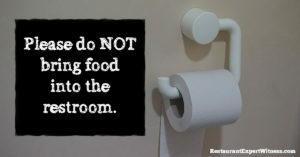 “Please do not bring food into the restroom.” That is something that we should not have to tell people! Recently, a person was injured after slipping and falling in a restroom at a buffet style restaurant. What caused the slip? Food. How did the food get in the restroom? Well, because the customer carried it into the restroom. For some reason, this particular customer thought it would be a good idea to carry their overfilled plate of food from the buffet into the restroom with them when nature called. Because the plate was so full and because the activities going on in the restroom are not conducive to carrying a plate of food, the customer spilled some of the food on the floor. When their feet met the food on the restroom floor, a slip and fall occurred that resulted in their injuries.